BIOTIQUE is based on 5000-year-old Ayurvedic recipes known to integrate and celebrate body, mind and spirit. This is the heritage and harmony of all Biotique products, blending proven Ayurvedic therapies with the science of 21st century bio-technology. MUSK ROOT has been called “the divine herb, found deep in the Himalayas and used for centuries to promote growth. 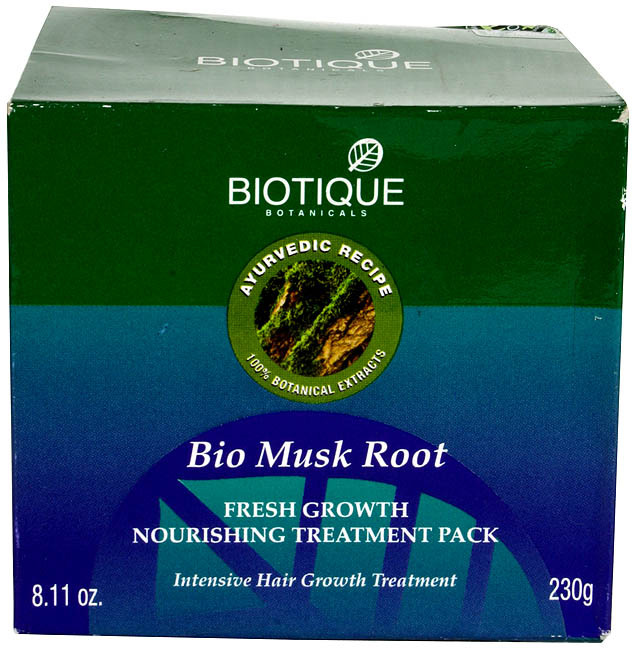 This nourishing treatment pack is a blend of pure musk, root,	bael, liquorice and nutmeg to invigorate and rejuvenate the scalp, add strength to every strand and promote growth for longer, thicker, strong hair. Amla (Emblica officinalis) 15.0%, Baheda (Terminalia belerica) 15.0% Harrar (Terminalia chebula) 15.0%, Jaiphal (Myristica fragrans)2.0%, Bael phal (Aegle marmelos) 5.0% Jatamansi (Nardostachys jatamansi)5.0%, Bhringraj (Eclipta erecta) 10.0%, Kikkar gaund (Acacia arabica) 4.0%, Mulethi (Glycyrriza glabra) 9.0%, Neem (Azadirchta indica) 1.5%, Himalayan Water Q.S.